All my crochet hooks are small ones, from .5mm to 5mm. So I thought it would be nice to be able to make my own large hook. 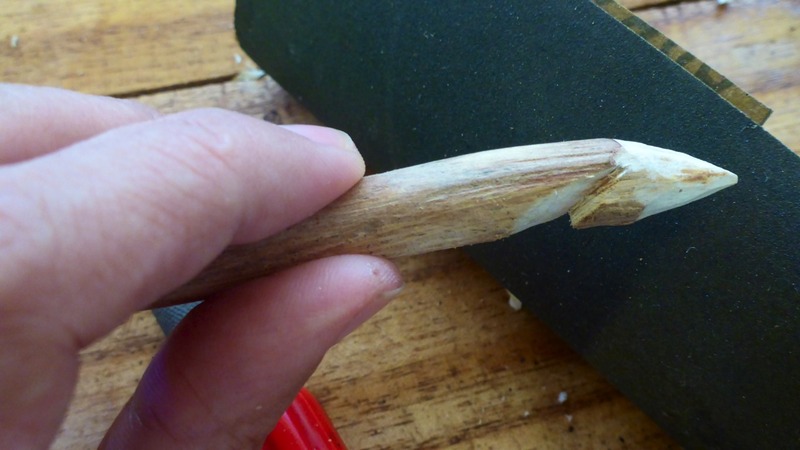 I have carved a few smaller hooks earlier but those were not so successful because they broke easily. 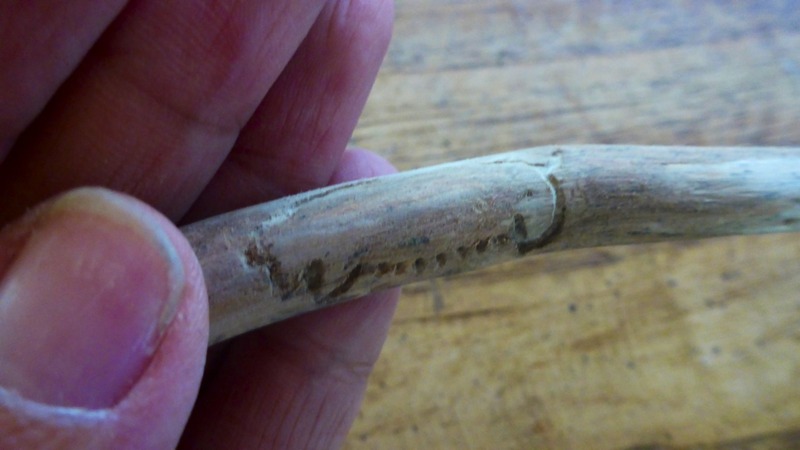 Hand carved wooden hooks would probably work best if they were bigger, for bigger yarn. Here's my piece of wood, a branch from the gmelina tree in the garden. This branch is very dry. It fell from the tree and I kept it for a couple of months. For carving I use X-acto knives and a large cutter. My knives are so rusty, I haven't used them in a long long time! 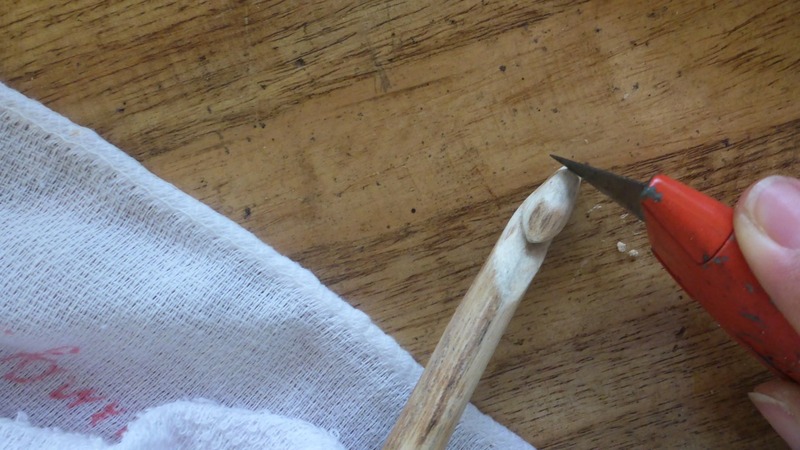 First is to clean the wood a bit, then make a slightly pointed tip. I used a large cutter for this, and the X-acto knife to make the pointed tip. 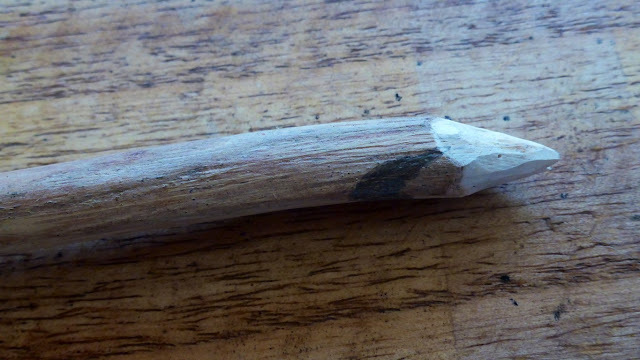 Next is to mark on the wood the place where the shaft of the hook will be carved (see photo above). 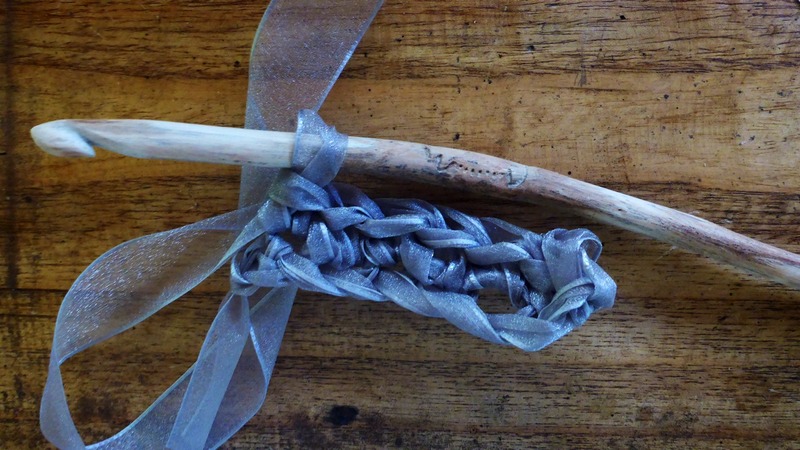 Since the wood has a curve, I held the wood as I would a crochet hook and made crocheting movements with it. 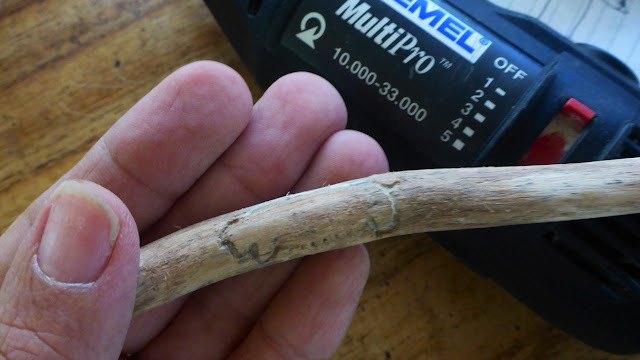 This helps me find the best place where to carve out the hook. The important thing is to find the best and most comfortable position for your hands. 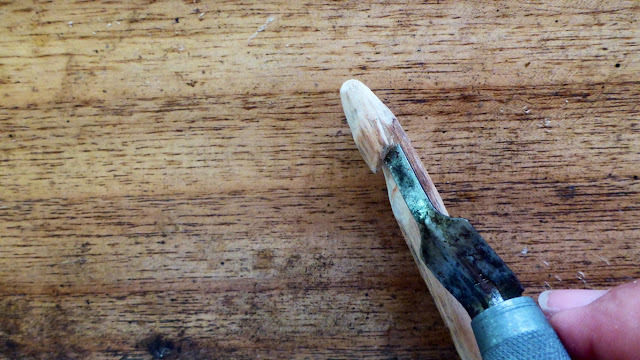 Don't make the shaft too close to the tip because you'll be trimming that pointed tip later on. Give it some space. 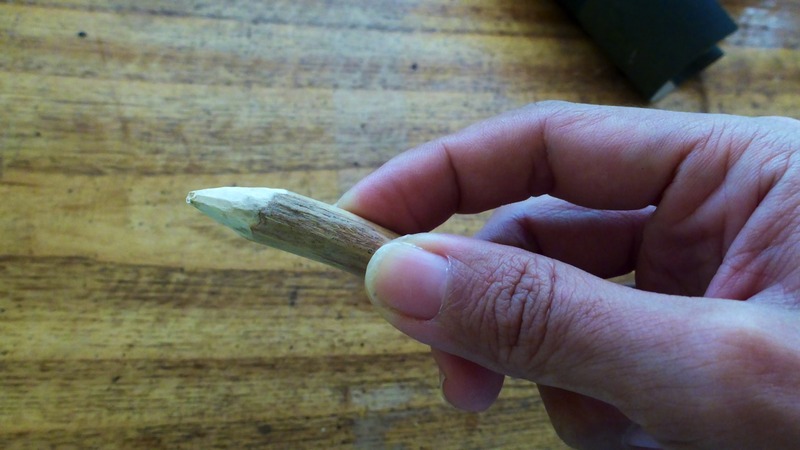 It's easier to correct an error by whittling away. 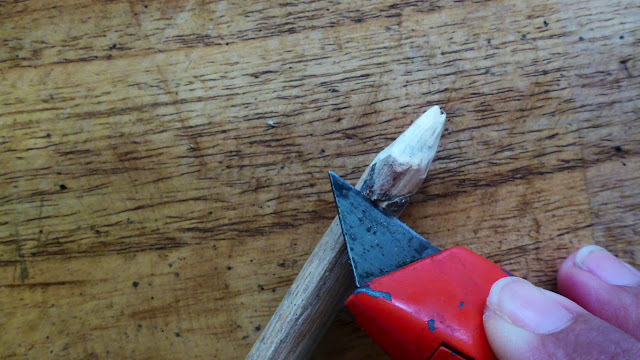 Using a suitable cutter, begin carving out the shaft of the hook, that area where you made the pencil mark. Work carefully, little by little. Don't cut away too much too soon. Stop to look at your work. Take your time and stop frequently to check your work. Use different knives to cut away at smaller areas. 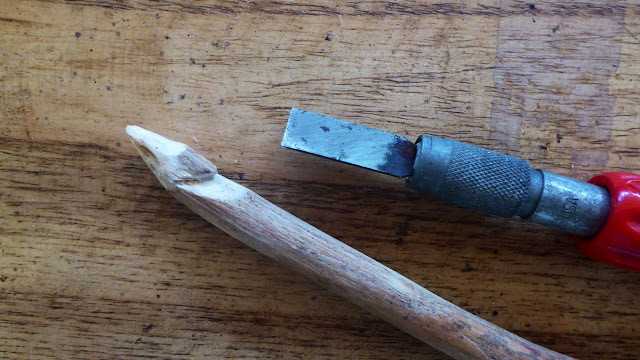 Below, I use a smaller flat knife to carve away at the edge of the shaft of the hook. And here's the hook so far (below). 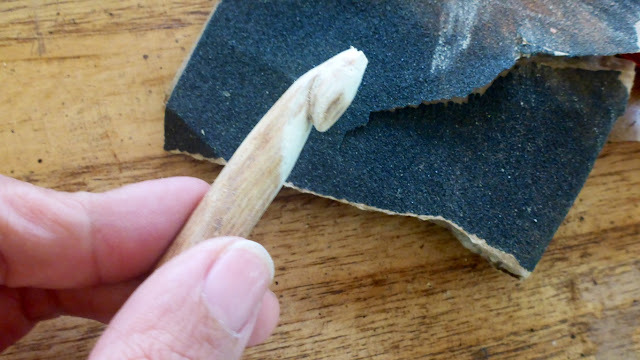 Next we need to trim the pointed tip of the hook and carve the "smile" of the hook - a line that goes from the shaft going up to the sides of the hook, along both sides. The tip of the hook is trimmed here (below). 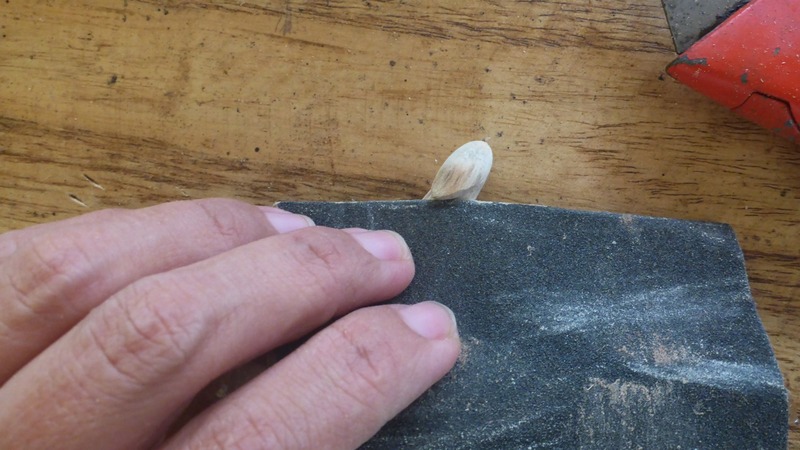 Then use a suitable gauge sandpaper to smoothen that area. Make it slightly round and smooth, not sharp. Here (below) is how I carve the "smile" of the hook! Sorry, I don't know what else to call that curved section at the sides of the shaft! 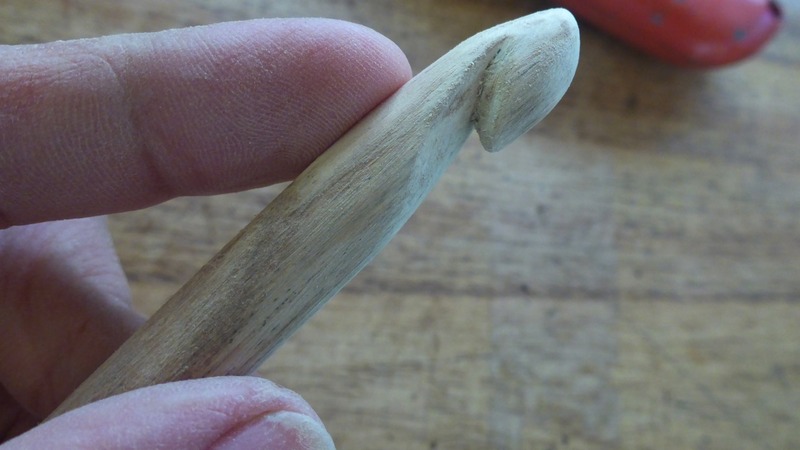 And here's my smiling hook with the tip trimmed and sanded. This will need more sanding. Sand under the curve of the hook, the shaft and the smile - these areas must be smooth so they don't snag the yarn. 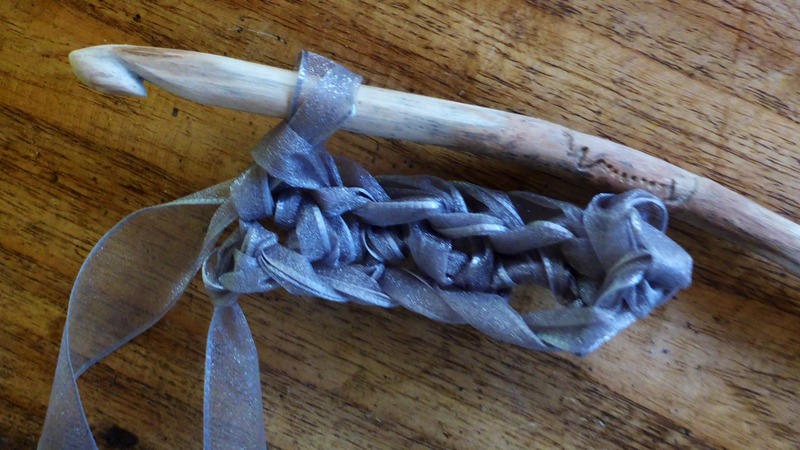 Test with a yarn to see where you need more sanding. Use a finer gauge sandpaper to finish. Here (below) I use an organza ribbon to test the hook. This ribbon snags a lot so it's a good test!! 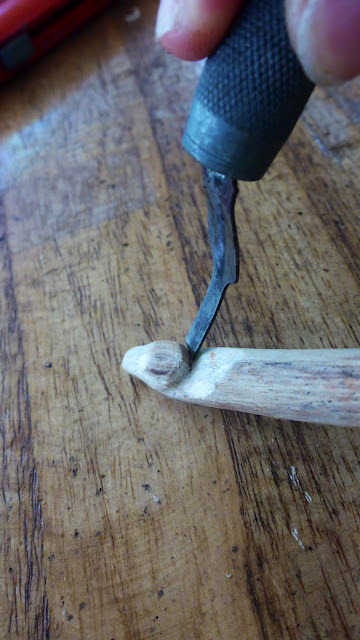 After the second sanding with finer sandpaper, here's the hook! Then I decided to put a simple decoration along the handle of the hook. 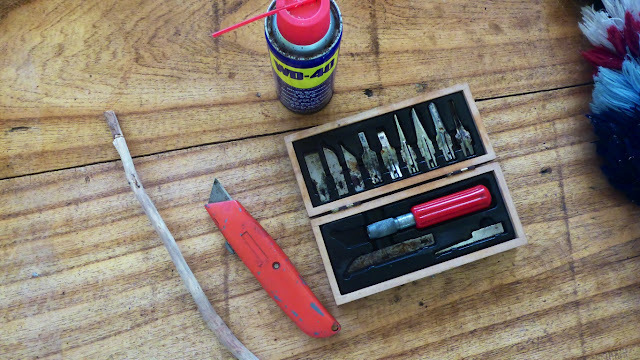 I got my old Dremel tool, oiled and tested it (thank goodness it still works! I haven't used it in 18 years!). Along the handle of the hook, I made an outline of a sow. This is to remind me of our sow Miss Piggy who died on Sunday because of the carelessness of as government veterinarian. She was injected with a powerful dose of Ivermectin and it was administered erroneously - intramuscular instead of subcutaneous injection. It was extremely upsetting! Here's Miss Piggy showing her teats! It wasn't easy carving this, I know it looks so simple, but with my bad eyes, trembling hands, and cloudy goggles on, it was hard!!! And so here's the finished hook! 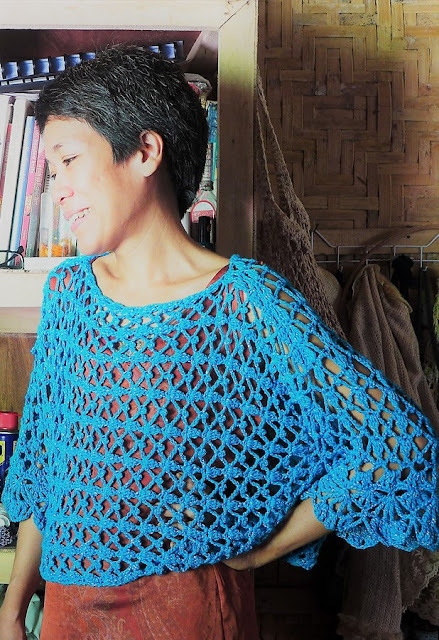 Testing with chain and single crochet stitches. It works beautifully!!!! The curved handle actually make this much more comfortable to use than the straight one. 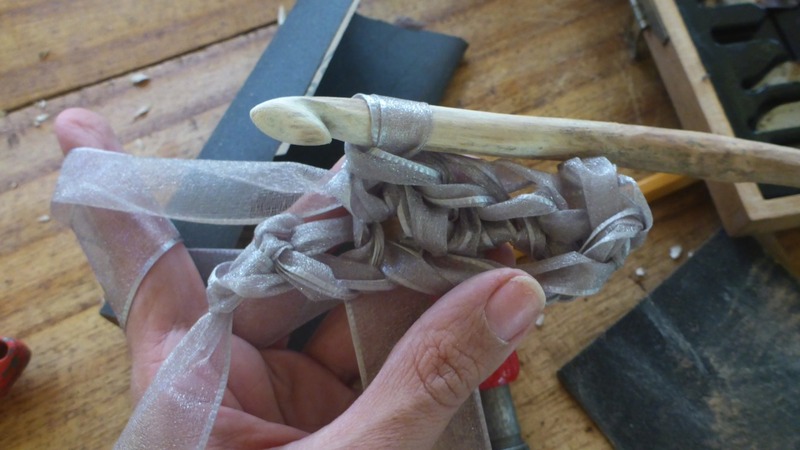 And since it isn't easy finding large hooks in the shops here, making your own is perfect! This is a hook maybe about 9-10mm. Very sad to hear about your lovely Miss Piggy. You made her a great honor with this beautiful hook. I love your work, thank you for sharing.